Founded in 1925 in France, Le Creuset history is steeped in their cast iron heritage, for which they are most well-known. Combining the expertise of the Industrialist founders, Le Creuset was born. When you think of Le Creuset you most likely image an orange casserole pot; Volcanic Orange was the original colour Le Creuset manufactured, and it remains one of the most popular colours today. Using recycled steel, Le Creuset cast iron is still manufactured in France and each piece is unique. For each Le Creuset piece which is cast, a sand mould is made which creates the shape of the cast iron piece. Once it has been cast the sand mould is broken and the sand is recycled. Le Creuset offers a lifetime guarantee with their cast iron which covers manufacturing and material defects, which are rare. The cast iron has glazed enamel inside the cookware making it non-stick (apart from the Satin Black finish which we’ll come to later). The great thing about cast iron is that it spreads heat quickly and evenly, making it energy efficient. Because of the properties of the cast iron it allows for flavour and nutrient retention – it can also be used on the hob, in the oven, and even kept in the fridge or freezer. It is important that cast iron isn’t subjected to thermo-shock, i.e. it can’t go from the freezer, or any cold environment straight into the oven as it may crack. Similarly, cast iron straight from the oven or hob should never be placed in a sink of cold water for the same reasons. One thing you may notice about Le Creuset cast iron is that some have black phenolic knobs while others have stainless steel knobs. Although there isn’t a huge amount of difference between the two, if your Le Creuset has a phenolic knob the maximum temperature for cooking is 190?c, while the stainless steel knob has a maximum cooking temperature of 260?c. Although Le Creuset is dishwasher safe it is best handwashed, so it is not subjected to harsh dishwasher tablets or water. Le Creuset also has a cast iron cleaner which they sell separately to keep it looking as good as new. It is not recommended to use steel scourers when cleaning cast iron, or metal utensils when cooking, and there are many plastic, silicone or wooden utensils available instead. When it comes to choosing which piece of cast iron is for you, there are a few things to consider. 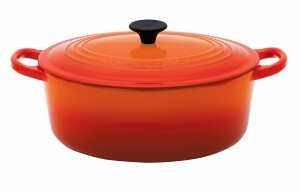 First is the shape – Le Creuset cast iron casserole dishes come in oval, round or shallow (pictured above) and in a range of different sizes. The round is possibly the most recognisable shape and sizes go from 18-30 cms. The oval shape is great for cooking joints of meat, while the shallow is highly versatile whether you use it to fry, bake, sauté or anything else. 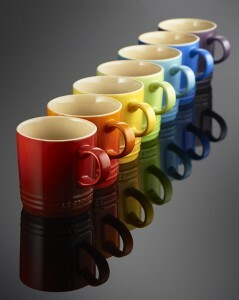 Over the years Le Creuset has added new colours to their cast iron ranging from blues and reds, to purples and greens. It’s not just what’s on the outside that’s important, the inside of Le Creuset cast iron will affect your cooking, as their cast iron pieces come with either a glazed enamel or satin black finish. The glazed enamel is easy to clean, as its smooth construction makes it very difficult for food to get stuck or burnt onto it. The satin black finish has a ‘rougher’ feel but is more resistant to higher heat surfaces, and is great for any budding chefs looking to create caramalisation in their cooking. Because of the nature of the satin black finish you may need to soak your pot (once cooled) to clean it. Le Creuset don’t just do cast iron however, they have also been producing stoneware for the last 40-50 years, manufactured to complement their cast iron range. The appeal of Le Creuset stoneware is wider than cast iron due to it being much cheaper to buy. This doesn’t mean it is of a lower quality, they are just two different types of product, and is also chip resistant. Le Creuset stoneware comes with a 5 year guarantee against manufacturing or material defects. The great thing is that it is oven, microwave, fridge and freezer safe, although it can’t be used on a hob. When used in an oven it is best to be placed in the middle, at a maximum temperature of 260?c. The stoneware range comes in a wide selection of colours as well as the individual products – from mugs, ramekins, to flan/pie dishes, as well as square, rectangular and oval dishes. 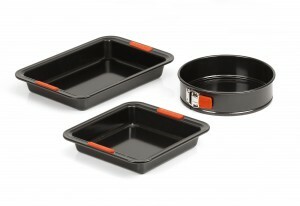 Another range Le Creuset has expanded into is bakeware. They use a heavy gauge carbon steel, which makes it strong, non-stick and means it won’t warp in the oven. It is even metal utensil friendly. All bakeware comes with a lifetime guarantee, and it is at a great price meaning you can have a high quality product for low cost. Le Creuset has proven themselves to be more than just casserole dishes, and while the ranges keep on growing, you will get the same great quality you’d expect from cast iron. baking, cast iron, Le Creuset, Le Creuset cast iron, stoneware. Bookmark.